I smile when I look back now and realise how naïve I was. It was my first major trip overseas and I arrived in Indira Gandhi International Airport, New Delhi at 9pm. I’d planned my three month itinerary for India well but I knew nothing about this city. I suddenly felt lost and out of my depth. Where was I going and how would I get there? The simple answer was to take a taxi to a hotel but I was on a budget. I didn’t want to get ripped off by an unscrupulous taxi driver charging me an inflated fare to take me to overpriced hotel owned by his uncle. And it quickly occurred to me that although I knew the conversion rate currency, I didn’t really know what a rupee would buy me. As I sought a tourist information desk I was stopped by a ‘government’ employee who offered his assistance arranging transport and accommodation. And so began a steep learning curve of hearing stories about it being ‘festival time’ in India. Accommodation was tight and the transport was fully booked. The only real option he told me was to stay in a hotel three times more expensive than I wanted and travel around by private car and driver. With the benefit of hindsight, I can see that I was being caught in a web of deceit. Inexperience was part of the problem but I made one critical error: I didn’t have a guidebook. If I had that time over again things would be very different. I’d have read the guidebook on the plane and have been fully prepared for my destination. Arriving in the airport I would have known my ideal transport and accommodation options and more importantly, how much I should pay for them. The following day I would have begun my sightseeing instead of trying to find a cheaper hotel and having a guided tour organised for me. In short, I would have saved time, energy and money. The lesson learned from all this was simple but very important. For every trip since I have used a guidebook both in my planning and everyday life on the road. I don’t necessarily agree with and use all their recommendations, but it is still a valuable tool. Apart from the obvious logistics, guidebooks also contain interesting historical and cultural information. The ease, convenience and time saved in not having to actively seek that out all helps to create a better travel experience. There are a few travellers who question the need for a guidebook and argue that they have a more ‘authentic’ experience without one. I don’t know exactly what they mean by ‘authentic’. Do they mean travelling like the pioneering hippies of the 1960’s? If that’s what they prefer then I hope they are happy. Personally though, I’m happy following in the footsteps of others if it makes my life easier. 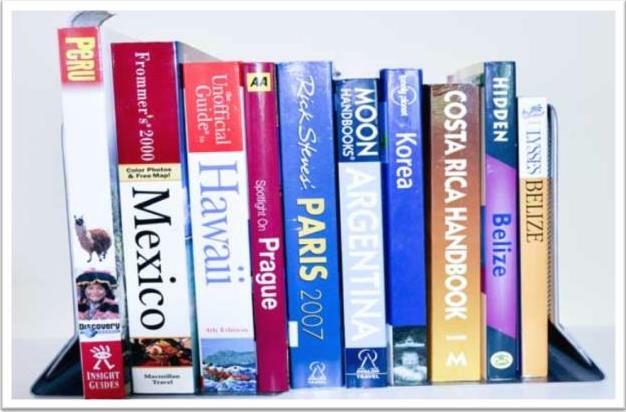 Every traveller is different and there’s no right or wrong but personally I’d never leave home without my guidebook.